Diastasis Recti - Pamela Morrison Pelvic Pain Physical Therapist, P.C. Diastasis Recti - Pamela Morrison Pelvic Pain Physical Therapist, P.C. Diastasis recti is a separation between the left and right side of the abdominal muscle which covers the front surface of the belly area called the rectus abdominis muscle. Diastasis recti is a common condition during pregnancy. As the fetus and uterus grows it may cause increase tension and pulling apart of the linea alba causing the abdominal muscles to separate. 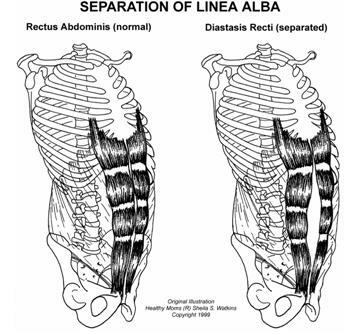 The linea alba is the connective tissue that attaches one side of the rectus abdominus muscle to the other. The diastasis may resemble a ridge down the center of the belly area and you may be able to feel the two separate edges of the rectus abdominus muscles. Diastasis recti is more commonly seen after multiple births but can be also be seen in a first time pregnancy. A diastasis recti that is not addressed can result in having significant core weakness, lack of pelvic organ support, incontinence, and eventual low back pain. A diastasis can be identified at your 6 week post partum exam at the obstetrician’s office or by your skilled therapist at Pamela Morrison Physical Therapy. How can Pamela Morrison Physical Therapy help Diastasis Recti? Your pelvic rehab expert at Pamela Morrison Physical Therapy will identify the diastasis recti at your 6 week post partum physical therapy evaluation or at anytime after labor and delivery. Specific testing occurs through manual palpation and using Rehabilitative Real-time ultrasound. Using an abdominal binder may be a crucial component of the rehab process and your therapist would measure and fit you for the proper binder. Specific diastais recti rehabilitative exercises are instructed. Pelvic alignment is assessed and corrected to achieve optimal results. Correction of the diastasis recti is critical prior to more pregnancies and may enhance having future successful painfree pregnancies and successful labor and delivery. Diastasis recti can even be improved many years after labor and delivery.